The book can be found at Barnes and noble, as well as at Amazon. A special edition version of the original hardcover version is available from Tekgear. ISBN: 0385658257 (Hardcover), Random House Inc, 304 pages, 2001.
top picks of 2002: "Here's our collection of our favourite digital culture experiences and tops events of the past year. Hands down, this has to be the Hal Niedzviecki - Steve Mann collaboration, Cyborg:Digital Destiny and Human Possibility in the Age of the Wearable Computer. For anyone concerned about the impact of technology on our identity or about the power of telecom devices to shape them, don't miss this one." Available online also from Barnes and Noble. This book presents, to the layperson, wearable, mobile, wireless computing and communication, and personal experiences of inventing, designing, building, and wearing computers for the past 20 years, as well as how these inventions affect society as a whole. Published October 2001 by Randomhouse Doubleday (Randomhouse and Doubleday have now merged). cyborg, n. a person whose physiological functioning is aided by or dependent upon a mechanical or electronic device. Steve Mann is a cyborg, and the inventor of the wearable computer, called the WearComp. He sees the world as images imprinted onto his retina by rays of laser light. This allows him to transmit his viewpoint live to the Internet, block out billboards and other unwanted visual stimuli, and turn his world into a series of hyperlinks. Constantly connected to the WearComp system, Mann has all the capabilities of a standard office at his disposal, even as he utilizes shrinking technologies to turn himself into a portable movie studio. The first person to live in total constant intimate contact with the computer, Steve Mann exists at once in the real and virtual worlds, living an entirely videographic existence, seeing everything around him, including himself, through a wearable computer. Over the past twenty years, Steve Mann has been his own human guinea pig, testing his various wearable computer prototypes on himself. In Cyborg, he uses his own unique experiences to assess the state of wearable computers and their potential impact on our lives, articulating a vision for a tomorrow that sees humanity freer, safer, and smarter in ways most of us can only imagine. Mann is fascinated by the possibilities of the cyborg future, but he does not shrink away from frankly discussing the dangers of a post-human age in which our computers come to control us. In this unique ground-breaking book, Mann charts the development of a wearable computer industry, and warns of dangers to our liberty, privacy, and democracy. He contrasts those dangers with his own sweeping inclusive vision of a wearable computing age that brings about new ways to teach, learn, make art, communicate, and even think. 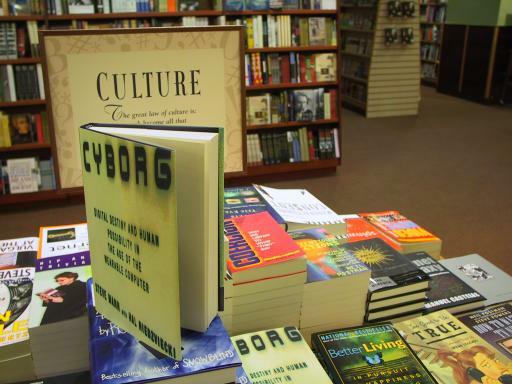 Part biography, part breath-taking manifesto, part startling look into the very near future, Cyborg is a powerful book that challenges preconceptions and invites readers to enter the mind of one of the most fascinating thinkers of our time. No one embodies this idea of the cyborg more clearly than Steve Mann, a University of Toronto professor who has invented and uses the world's first wearable computer. The subject of a recent lecture in Laurier's Paul Martin Centre, Mann has spent the last 20 years in existence mediated by his computer and the laser that projects images directly into his eye, creating what filmmaker Peter Lynch refers to as "a cross between Inspector Gadget and Michael Moore" and "an idiosyncratic inventor." ... "Steve's lifelong experiment with wearable computers gives us a sort of a living metaphor for our everyday coexistence with technology," explains Laurier's David Black, an event organizer. "In the extreme nature of his cyborg self we have a glimpse or understanding of our everyday codependency with technology. He's living five minutes in the future." Mann describes with hilarious deadpan irony a number of devices he has actually patented. Particularly timely, when all loyal Americans seem to think it obvious that all loyal Americans must be prepared to give up freedom for the sake of securing freedom, is the plan for a "Mass Decontamination facility" in case of an anthrax attack or civil unrest. Visitors are stripped and required to pass through hexagonal rooms equipped with internet-connected showers combined with body scanning machines. This is an important book, which easily captured my attention and interest. In the spirit of a true cyborg, Steve Mann explores both the human and technological issues involved with living in an increasingly digital society. Steve Mann is a University of Toronto electrical and computer engineering professor who has been experimenting with computing technologies he has invented and worn on his body since the late 1970s. Steve Mann is perhaps the most advanced example of a real "cyborg" alive today, and his book combines autobiography and cultural criticism with respect to technology, culture, and identity. ... that is, we are all cyborgs - and Mann is simply a more self-conscious and advanced form of what we are, with our cyborg technologies like cell phones, Walkmen, personal digital assistants like Palm Pilots, etc. When I finally catch up with the man who invented the concept (wearable computer or WearComp) about 20 years ago, Professor Steve Mann of the University of Toronto, he explains why he could not get back to me more quickly by e-mail. It seems he was underwater when he got my message. the book for which we've been waiting for months turned out to be so good, we'll devote a whole column to it later on. Cyborg: Digital Destiny and Human Possibility in the Age of the Wearable Computer, by Steve Mann and Hal Niedzviecki is a landmark book. ... to learn what it means to integrate human and machine capabilities. ... recognize an extraordinary pioneer in the next great human journey, a man with insight, principles and, above all, an indomitable passion for the freedom of the human spirit. ... don't miss this one.